MANILA, Philippines — Arellano University spoiled University of Perpetual Help’s grand slam aspirations, 22-25, 25-15, 25-18, 25-18, imposing its supremacy for the third straight year in the NCAA season 94 women’s volleyball in the last of their best-of-three clash for the crown. 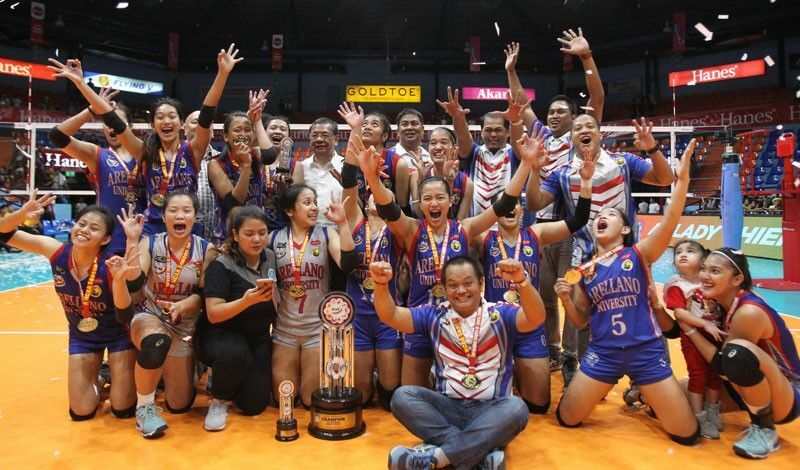 Only one hardware stood between UPHSD and its quest for a rare triple kill for all its volleyball teams but the Lady Altas could not duplicate for their school what two other teams – San Sebastian and former league member Ateneo – earlier accomplished. Instead, it was the Lady Chiefs who shared a joyous hug at centercourt as they snared their third straight title and fourth crown in five seasons. “Talagang mataas ang respeto ko sa Perpetual. Pinilit nilang ilabas kung ano ang dapat naming ilabas. ‘Yung pagkatalo namin sa kanila sa Game One, dahil doon natuto kaming bumangon,” said AU coach Obet Javier. MVP Necole Ebuen put the Lady Chiefs at championship point on a crosscourt hit and though a setting error by Rhea Ramirez gave UPHSD a flicker of hope, Jenny Gaviola sent her service wide, leaving her and the rest of the Lady Altas stunned. It was a deja vu of sorts for Perpetual Help, which also surrendered Game Two, 23-25, 25-9, 25-18, 22-25, 15-12, on Hershey Llorente’s serve that also sailed long. UPHSD took the series opener, 21-25, 25-17, 25-21, 25-20. “Papunta ng Game Three, sabi namin sa practice, ibinibigay na sa atin ng Panginoon. Kung hindi para sa atin, dapat Game Two natapos na. Kailangan kunin na natin itong pagkakataong maka-set kami ng history sa school,” said Javier. Regine Arocha fired 16 points and put in 11 excellent receptions for AU and later took home her second straight Finals MVP award. Princess Bello posted 12 points while Necole Ebuen and Carla Donato turned in 11 each for the Lady Chiefs. Cindy Imbo was limited to 12 points while Shyra Umandal and Jenny Gaviola produced 10 each for the Lady Altas. The Lady Chiefs exploited the Lady Altas’ shaky reception and erratic plays in the second and third frames to gain a 2-1 set advantage after fading against UPHSD’s late run in the opener.